A simple, well-designed summing mixer with a focus on clarity. Not cheap, but this kind of quality costs. Clarity and integrity of signal path. Superb build quality. Simple and well-laid-out Controls. Not cheap (although you do get what you pay for). As is standard with TC gear, the Little Bustard not only does the job but looks the business too. The unbalanced XLRs avoid any colouration caused by balancing transformers, op amps or transistors. The rackmounted summing mixer has recently become the premier means of getting your in-the-box mix out of the box for some wholesome analogue conditioning before it goes back into the box. Thermionic Culture responded to this trend with typical aplomb by issuing the impressive Fat Bustard. 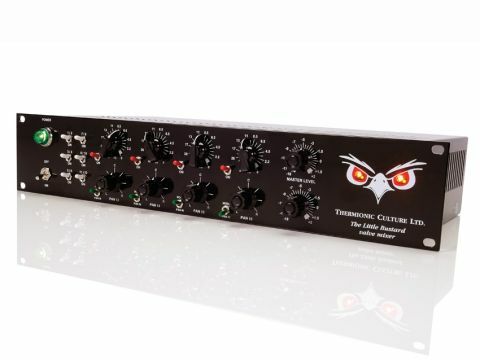 To expand that unit's 12 channels (via the Aux 1 & 2 inputs) TC has created the Little Bustard, a 16-channel summing mixer which keeps to the house speciality (valve amplification only) in a 2U casing. "A peek at the Bustard's innards reveals the hand-wired beauty that comes as standard with TC gear." Unlike the Fat Bustard, this unit doesn't feature any signal processing (EQ, distortion/attitude, stereo expansion) and offers the user six fixed gain stereo channels, four mono channels with Gain/Pan controls and independent left and right Master Level knobs. The rise of 'in-the-box' mixing has still left a lot of engineers cold, with poor stereo imaging and loss of clarity/depth cited as problem areas. Though it has been argued that a lot of this is subjective, there are real causes for poor summing in the digital realm, such as large track counts generating massive calculations that challenge CPUs/DSP chips (which are also running plug-ins and hard drives) and even high bit-depth internal processing. These problems can be program-dependent and digital mixing can be extremely accurate when treated right; even so, analogue summing is free from these problems and offers some added benefits. The infinite degree of variation in voltage/current means that analogue mixing can achieve an extremely fine degree of clarity and articulation. The earliest mixing consoles were basically summing mixers, but these soon became loaded with EQs, routing options and dynamics that brought a myriad of noisy components that mostly degraded the mix. And so it is that we return to the trusty summing mixer to get the best of analogue and skip all those bits we already have in our shiny new DAWs. The I/O is via XLRs at the rear (16 input, two output) and operates entirely unbalanced, thus forgoing any colouration or noise contributed by balancing transformers, op amps or transistors (the Fat Bustard, like many TC units, is also unbalanced). The gloss black front panel carries the Thermionic design aesthetic, from the big green power light to the chicken head knobs. At the left are the six stereo channel on/off switches. In the middle are the four mono channels with their individual Gain controls (from ∞ to 0dB/unity), on/off switch, Pan knob and Pan 'In' switch. When set to 'Mono' mode, as opposed to 'Pan In', this latter switch adds 6dB - more on this below. To the right of the mono channels are the two Master Level knobs, which range from -18dB to +2dB. At the far right of the facia is the Bustard's face, the eyes of which house the output level indicators. Two small amber LEDs indicate 'signal present' while larger, multi-coloured LEDs use a traffic light system to show how hard the output is being driven. Thanks to the well-laid-out front panel, the Little Bustard is easy to use and feels reassuringly solid. All of the control pots are indented: 21 positions for the mono channel gain and Pan pots and 31 positions for the two master levels. This is particularly useful for matching levels between channels and the master outputs, as well as for Pan position setting - the 'one click up/one click down' routine makes life a lot easier, compared to nudging a pot back and forth. The quality on the outside is matched by that of the inside, as having a peek at the Little Bustard's innards reveals the hand-wired beauty that comes as standard with TC gear. The six fixed gain stereo channels do just what they claim to, and offer unity gain summing. There is plenty of clean headroom available, so these inputs can take hot signals with little discernible distortion. Pulling back the Master Levels deals with most distortion issues caused by summing a lot of high-level sources, and the Bustard's eyes alert you before your ears do. The four mono channels create a little more flexibility for either stereo pairs that require Gain/Pan adjustment or mono sources that need fine-tuning in a mix, such as vocals and bass. The indented pots come in very handy here for 'vocal up/vocal down' mixes prior to mastering. The +6dB function from the Pan In switch is great for poking a source out of the top of the mix. The Little Bustard uses an essentially simple design with a separate summing gain stage (ECC83 valves) and output amplification stage (PC86s), the beauty of which translates into high headroom (low distortion) and very low noise. There is also extremely low crosstalk between channels and within stereo channels, which means that stereo imaging remains untainted. The Little Bustard is surprisingly, though pleasingly, transparent. When driven hard, it will start to distort; this gives good results with transient sources, such as drums, where the peaks are compressed a little, effectively 'fattening' the whole mix. That said, this is not a device one would use to 'warm up' signals and it will not miraculously reanimate lifeless digital recordings. This isn't a criticism, as all too often valves are associated with colouration, and though they are more than capable of distorting a source they are also exceptional amplifiers and when used in a well designed circuit they can out-perform their solid state counterparts. We all know what a summing mixer does, but what is it really useful for? Our favourite use for the Little Bustard has been drum sub-mixing, where the overheads, room mics, toms and reverbs can be sent to the fixed-gain stereo channels with the kick, snare and hi-hats mixed via the mono channels. The results were excellent and an improvement on the DAW version, thanks to a little transient distortion via the +6dB on mono channels and driving the inputs hard. The unit is also an excellent way to recombine outboard parallel compression setups, sum group busses after analogue processing or before final A/D conversion, and expanding a small desk setup. Obviously, there are many uses for a summing mixer (effects returns, multiple synth setups, etc), especially one that does the job with such clarity. The Little Bustard indeed makes a great expander for its 'Fat' counterpart, especially thanks to the excellent signal path. As a standalone unit this is definitely a tool rather than a character maker, though again the transient distortion when driven adds bite to drum, guitar or brass sub-mixes. There are cheaper alternatives but, as is so often the case, we doubt you'll find as efficient a signal path. Also, it's Thermionic Culture, so it looks cool and will last a lifetime.